She has received awards from the Guggenheim Foundation, the American Academy of Arts & Letters (two awards), the Pew Fellowship in the Arts, the International League of Women Composers, Composers Inc. (the Lee Ettelson Prize), the University of Delaware New Music Competition, the Louisville Orchestra New Music Search, the Cincinnati Symphony's Young Composer's Competition, NACUSA, and ASCAP. In addition she has received grants from the National Endowment for the Arts, Meet-the-Composer, and the Pennsylvania Council on the Arts. 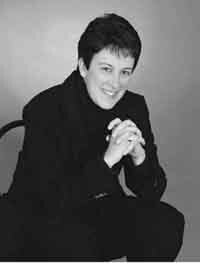 She has served as Composer-in-Residence with the Music From Angel Fire Festival, the Norfolk Chamber Music Festival, the Walden School, the Yerba Buena Center in San Francisco, and the Prism Saxophone Quartet. Most recently she was named Composer-in-Residence with the Philadelphia Singers. Her work, Shine, was named Best Contemporary Piece of 1996 by USA Today in their year-end classical picks. Upcoming commissions include works for the Cypress String Quartet, the Ying Quartet, eighth blackbird, the Gilmore Piano Festival, the Philadelphia Singers, the Vail Music Festival, the Brooklyn Philharmonic, the Pittsburgh Symphony, the Baltimore Symphony, and National Symphony. Recent commissions come from groups that are as diverse as the The Philadelphia Orchestra, The Atlanta Symphony, The Minnesota Orchestra, The Oregon Symphony, The Curtis Institute of Music Symphony Orchestra, the American Composers Orchestra, the Women's Philharmonic, St. Lukes' Chamber Ensemble, pianist Gary Graffman and the Lark String Quartet, the Verdehr Trio, The American Guild of Organists, The Network for New Music, The National Flute Association, the DaVinci String Quartet, ZAWA! and flutist Carol Wincenc. Her works have been recorded on two dozen CDs. During 2003, Telarc will release her work blue cathedral on a recording with the Atlanta Symphony, Robert Spano, conducting. The year will also see the release of half a dozen other works on various labels. As a flutist, she is recorded on the Access and I Virtuosi labels and as a conductor on CRI.